Big and Little Lake Harris combined cover over 16,000 acres of water. Little Lake Harris contains all the water east of the Howey Bridge. The water west of the bridge is considered Big Lake Harris. Little Lake Harris is mostly undeveloped and is very popular with fishermen and kayakers. A spring in the back of Double Run makes for a beautiful boat trip and causes the water clarity in this lake to be considerably clearer than the rest of the Chain. Royal Harbor at the top of Little Lake Harris is a popular waterfront retirement community with approximately 700 homes. Hickory Point Marina, directly across the street, is the largest water park on the chain. 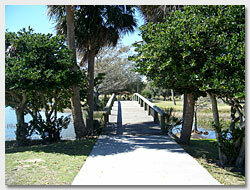 Deep water boat docks, numerous ramps, picnic and barbeque areas, a large pavilion, soccer fields and lots of open space make this a very popular park with locals and visitors alike. There is also a modern dry storage marina nearby. Little Lake Harris has numerous canals with reasonably priced waterfront homes. The development of Lake Harris Shores has the deepest canals in the chain at well over 8 feet deep. The picturesque town of Howey-in-the-Hills is located on the western shore of Little Lake Harris. Howey is also the location of the well known Mission Inn Resort with its two outstanding golf courses, on-site tennis pro, lakeside marina, upscale restaurants and luxury homes. Big Lake Harris is one of the largest lakes in Florida and one of the most beautiful. Steep hills all along the northern shoreline near Johnson's Point make for elevations unique to the rest of the State. At one time, these lakes were completely surrounded by orange groves. Two back to back freezes in 1988 and 1989 put an end to most of the groves with the lakefront now covered with luxury home sites. Some of the most expensive real estate in Lake County is located on Lake Harris in a gated community called "The Peninsula". The waterfront Peninsula homes all have rear western exposure, making spectacular sunsets the norm. Homes range from just over 3,000 sq. ft. to well over 6,000 sq. ft. The City of Leesburg with its newly renovated downtown area and beautiful Venetian Gardens Waterfront Park is located on the west side of Lake Harris. 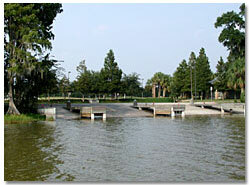 A public boat ramp is located in the park along with an in-water and dry storage marina. 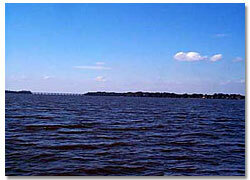 The City of Leesburg is the business center of Lake County and a popular retirement destination. Numerous newer 55+ communities have been built during the past 10 years. The Villages, the largest retirement community in the US with over 80,000 residents is located in Lady Lake just north of the City of Leesburg. Yalaha is a small village frozen in time. Located on the southern shore of Big Lake Harris it's noted for it's famous Yalaha Bakery where local entertainers perform free Saturday Concerts. All the baking is done on premises and the baked goods are fantastic. Yalaha also has many luxury waterfront homes with expansive views of Big Lake Harris. Numerous springs located in Yalaha continuously pump clear spring water into the Chain, helping to keep lake water levels consistent. If you have questions about Lake Harris, please contact us.